B B Eye Foundation is the pioneer of Modern Cataract Surgery in Eastern India. It started IOL microsurgery in the ’80s and Phacoemulsification in the nineties.From a Cataract Surgery unit in the eighties, today,it is a multi superspeciality centre for excellence in eye care. Presently it offers you more than a couple of decades of experience and the best of skills in cataract surgery along with the latest state of the art instruments for customized treatment. 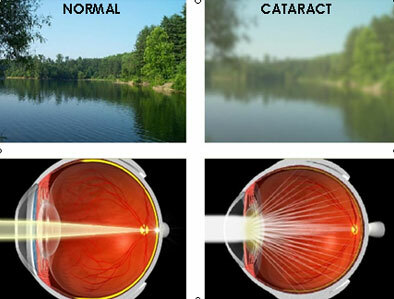 Cataract is the clouding of the lens inside your eye. It can develop in one or both eyes at the same or different times. One eye can often be more affected than the other. The crystalline lens is normally clear. It allows light to pass through to the back of your eye, helping you to see sharp images. If parts of the lens become cloudy (opaque), light cannot pass through the cloudy patches. With advancing age, these patches usually become bigger, and more of them develop. As less light is able to pass through the lens, your vision may become blurry or cloudy. The cloudier the lens becomes, the more your sight will be affected. Cataracts are the main cause of impaired vision in the world, especially in developing countries. They affect men and women equally. Cataracts are most commonly found in older people. These are called age-related cataracts. Rarely, babies can have cataracts when they are born, referred to as congenital cataracts. What do you feel as cataract progresses? If your cataracts are mild, you may not notice any symptoms to start with. Blurred, cloudy or misty vision is the most common symptom of age-related cataracts. You may have small spots or dots in your vision - patches where your sight is not as clear. when the light is bright, such as on a very sunny day or in bright artificial light. reading, watching TV and other daily activities may be more difficult than they used to be. If you wear glasses, you may find that they have become less effective. Less commonly, you may see a halo (a circle of light) around bright lights such as car headlights or street lights. A rare symptom of cataracts is double vision (seeing two images of an object instead of one). 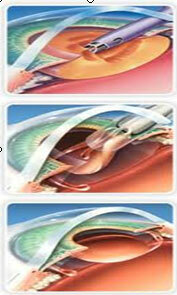 The causes of age-related cataracts are not known. Research suggests that some factors may increase the risk that cataracts will develop. As people grow older, there can be changes to the protein that makes up the lens in the eye resulting in clouding of the lens. taking steroid medicines for a long time. other eye conditions, such as uveitis (inflammation of the uveal tract in the eye). With the recent advances in cataract surgery, patients can get their cataracts operated upon when they feel difficulty in performing their daily work. It is a customised procedure with a wide array of Intraocular Lenses to choose from. Cataracts are treated by having an operation to remove the cloudy lens in your eye and replacing it with an artificial clear lens. This is called an intraocular implant or intraocular lens (IOL). The most common methods for removing cataracts include Phacoemulsification, Small Incision Cataract Surgery(SICS) and Extra capsular Catarct Extraction. 1. Phacoemulsification: In this method a tiny ultrasound probe is inserted through a very small incision about 2 - 2.8mm. The instrument uses ultrasound vibrations to break the cataract into fine pieces, which are gently suctioned out. The new foldable lens is then inserted into the eye. Usually no stitches are required to close the incision. This minimal surgery, lasting for 15-25min, allows faster and safer healing, hastening your return to normal activity. 2. SICS: Here your eye will receive a cut of about 6 to 7 mm. The cataract is removed manually and an IOL is put inside the eye. This surgery usually does not require suturing and allows a post operative recovery faster than ECCE. 3. Extracapsular Cataract Extraction(ECCE): Here the cloudy lens is removed in a single piece through a 9-11mm. incision. It is replaced with an artificial lens and the incision is closed with fine stitches. The surgeon may opt for this technique in cases where the cataract is very advanced. The recovery period is longer here. In most cases, cataract surgery does not require over night stay. It is usually performed as a “Day Care” procedure wherein the patient comes in for surgery after having put some antibiotic drops in his eyes over the last 1-3 days. Just before the operation, drops to widen (dilate) your pupil will be applied to your eye. You will also be given a local anaesthetic. This may be applied to your eye as drops, although sometimes injections in the tissue around the eye may be used instead. Once the anaesthetic takes effect, you will not be able to feel anything. While the operation is taking place, all you will be able to see is a bright light. You will not be able to see what is happening. Fixed strength lenses (monofocal) - set for one level of vision, usually distance vision. You will need a light glass or no glass for distance vision, whereas glasses will be required for near work always. Multifocal lenses - allow two or more different strengths, such as near and distance vision. Accommodating lenses - allow the eye to focus on both near and distant objects, in a similar way to the natural human lens. Toric IOLs - are for those who have cylindrical power, also referred to as corneal astigmatism. Your Ophthalmologist will discuss with you what type of lens will suit you. For most people, vision improves noticeably straightaway, although it may take a little while to settle down completely. The cut in the eye's surface is so small that it usually heals by itself, although sometimes a small stitch may be needed. close to you (near vision). If you wore glasses before, your prescription will probably change. It takes several weeks after the operation for your vision to settle down before your optician can give you a new prescription. Are there ways to prevent cataract? NO. It is not possible to prevent cataracts. protecting your eyes from sunlight, by wearing sunglasses and a hat with a peak or wide brim. a healthy diet may slow down the growth of age-related cataracts. It is important to have your eyes tested regularly by an ophthalmologist, even if you do not wear glasses. This enables cataracts to be picked up early, as well as other eye conditions, such as Glaucoma and age-related macular degeneration. Diabetes: People with diabetes tend to develop cataracts at an earlier age than others. If you have diabetes, please follow your diabetologist’s advice closely. This will help to reduce the risk of developing cataracts, as well as other eye problems, such as diabetic retinopathy (a condition that damages the tiny blood vessels that nourish the retina at the back of the eye).